If you love The Movie Reel and want to drop by and talk film one last time, don’t miss their farewell party on April 11. Drinks at bar prices, live music by The Tarantinos, in-store from 8pm to midnight. Sad times in Westgarth Village – The Movie Reel will be closing in April. This treasure trove of film has been open since 1988, and has done sterling work to satisfy my arthouse, cult and kung fu cravings. Thanks Robert, Ben and all the other staff – you are awesome, and will definitely be missed! Look out for their huge DVD sale, which starts on March 17. Rubble Designs are setting up shop in Westgarth Village! They make furniture from recycled/salvaged timber, and will be opening later this month. Find Rubble Designs at 63 High St, Northcote (where Mally Studio used to be). 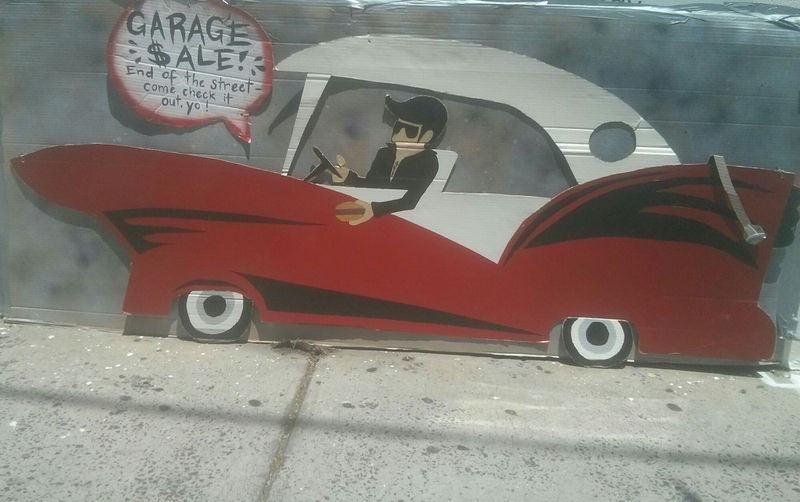 best garage sale sign ever! For those who came in late, Dean Sunshine launched his new book yesterday. Street Art Now is 200+ pages of fabulous, from Australia and overseas. For those of you on Instagram, artists deets are included so you can easily follow your favourites. Just $59.95 ($104.95 International) from the Land of Sunshine website, or find it at many bookstores and galleries around town. The Silent Auction panels were amazing, with all funds raised going to charities chosen by the artists. Hard to take pics of large pieces with cider in hand (and a nearly flat phone camera – omg) but here we go – works by Smug, Conrad Bizjak, Bailer, Deb, Jack Douglas, Putos, Itch, Mysterious Al and Phoenix. Steen Jones, Sofles, Dvate, Bailer and Be Free also had panels up for auction on the night. Congratulations Mister Sunshine!